Bender was walking up toward the line of scrimmage to yell out something and Fontana snapped it to him early. That made it 3rd & 11 and Bender passed to Pooka for 5 yards. After timeout on 4th & 6 at OU 40, Bender sped up on pass toward Pooka in right flat. Incomplete. Beaty continues to be the bacon of timeout calls! Kennedy Brooks makes it 3 TD drives in a row for Oklahoma. 7-yard rushing TD makes the Sooners' lead 21-10. Entering today, OU averaged 3.85 points per offensive possession this season, putting points on the scoreboard on 59 percent of its possessions, and scoring touchdowns 50 percent of the time. The Beaty era lives on! 0 timeouts left on KU's final possession of the half. Pooka runs for 10 yards, then 19. Fox guys are drinking the kool aid saying Beaty has made KU much better and think he should get another hc job?????? But OU offense would probably have 4 TDs to KU's 1 if Mike Lee hadn't come up with that strip in 1Q. That ends OU's first series of 2nd half pretty quickly. Pooka Williams should have been tackled who knows how many times but refuses to give up on the play and gains 8 yards to get KU in 3rd & 4. Herbert converts it with 5-yard run. KU offense once again capitalizes on a KU defensive takeaway with a TD drive. Khalil Herbert takes it across the goal line from 3 yards out. Pooka Williams has 137 yards on 10 carries. Murray takes off on 4th & short at KU 28 for 5 yards and a 1st down. We'll see if they can make it 4. Kyler Murray at it again. Zooms for an 11-yard rushing TD. He's got 3 total TDs. First 3 and out of the night for KU on its second possession of 3Q. Followed by 34-yard punt return by sensational CeeDee Lamb. Kennedy Brooks has his 2nd TD run and Sooners are up 35-17. Brooks up to 142 rushing yards. Final play of 3Q is first 2nd-half carry for Pooka Williams. Takes off for 45 yards. #KUfball enters 4Q at No. 6 OU down 35-17. FOX broadcaster Tim Brando: There's going to be a lot of news in the next 24 hours about the next head coach at Kansas. Carter Stanley at QB with KU inside the 10 yard line. But Pooka throws a TD pass to Jeremiah Booker. Jayhawks cut OU lead to 35-24. Pooka has 9 passing yards & TD. 181 rushing yards & TD. Yo. Kyler Murray in the open field. Kick after Murray's TD was blocked and Coe Harris tried to return it. Couldn't find quite enough space for 2 points. #KUfball down 41-24. How good would KU be with Kyler Murray at qb? Thompson's punt blocked, scooped and scored. Bolton with the special teams TD for OU. Curtis Bolton 9-yard return for TD. 224 rushing yards and 2 TDs for Pooka. It's 48-32 OU after Kansas converts on 2-point conversion. Bender throws to Sims, who laterals to Herbert for the score. Make it 5 total TDs for Murray after an 11-yard pass to Calcaterra. 25-yard TD run for Herbert. The OU defense having some issues. 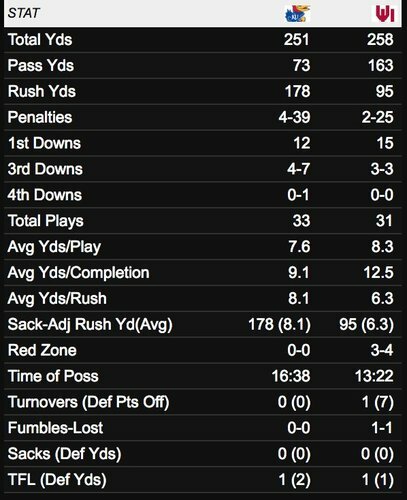 348 rushing yards for Kansas. Well designed play for 2 more points - Stanley could have kept it, then made a quick shovel to Humphrey. 252 rushing yards for Pooka Williams. #KUfball covered the spread in Saturday's 55-40 loss at No. 6 Oklahoma... Was Les Miles watching? If so, he surely saw plenty he liked. Pooka Williams averaged 16.8 yards per carry on 15 attempts against OU.